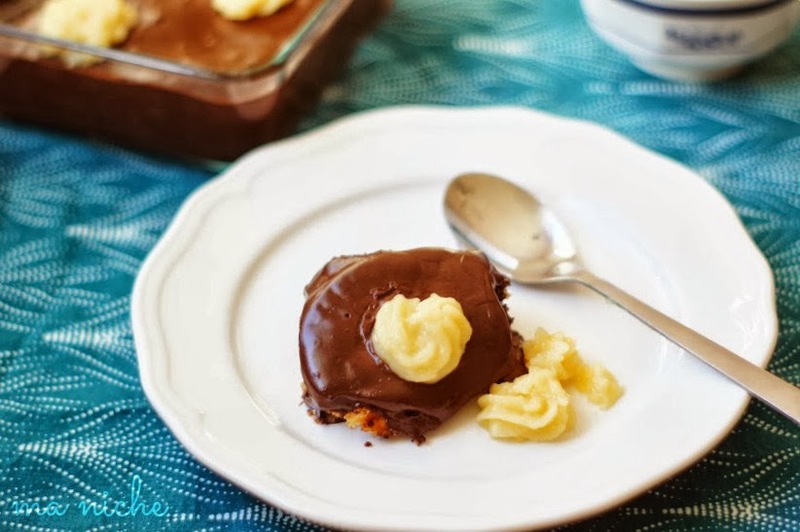 Ma Niche : The Best Biscuit Pudding Ever ! 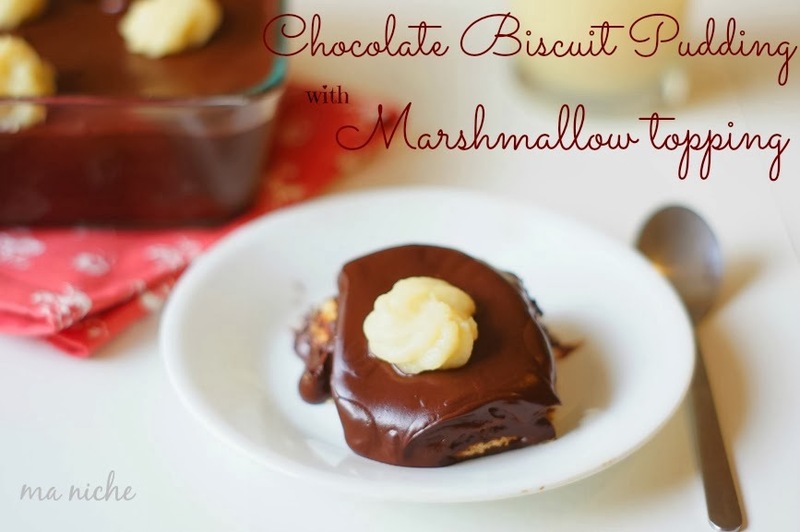 The Best Biscuit Pudding Ever ! My sister-in-laws vacation is coming to an end. She will be leaving for India next week. But she possibly couldn't leave before treating us to her Biscuit pudding. Like my husband and brother-in-law, she too completed her education in a boarding school and it was there that she learnt this recipe. While the recipe is constant in spirit, over the years the boarders at her hostel have adapted the original one and made their own versions. I have tasted a few others over the last 8 years of our marriage and I must say that each one was delightful. The basic ingredients of the pudding are butter, cocoa, sugar coffee and arrowroot biscuits. However, since Sheryl chose cocoa and marshmallows as the ingredients for this month's dessert challenge, I sneaked in some marshmallows in the recipe in the form of a citrusy marshmallow topping. You may skip the topping altogether if you wish. But if you want that extra ump factor ... whip it up. Its lovely ! Mix the cocoa powder and powdered sugar. Gradually add the mixture to the softened butter and keep mixing. Add milk when you are unable to mix anymore and mix thoroughly. The chocolate sauce ready. Dip Marie biscuits in coffee decoction. Place them in a layer in a flat glass or metal container with a border. Then make a layer of the chocolate sauce on top of that. Then a layer of biscuits, etc. 4 or 5 layers totally. Freeze it for about 2 or 3 hours. Garnish with the Marshmallow topping if you like and serve cold. Put marshmallow, water and butter in a heavy bottomed saucepan. Holding the saucepan over gentle heat and stirring continuously, melt contents of the saucepan. Lower the flame and add the remaining ingredients. Stirring gently simmer them together until the mixture thickens slightly and obtains the texture of a smooth sauce. Switching off the heat, allow the sauce to come to room temperature. Sure looks yummy! I had never heard of Marie biscuit or coffee decoction! 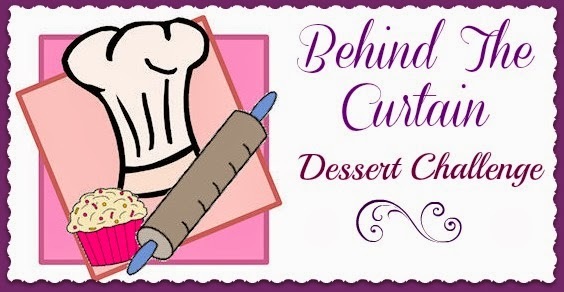 Glad you participated in the Lady Behind the Curtain Dessert Challenge. HUGS! Award for you in my space . collect it . 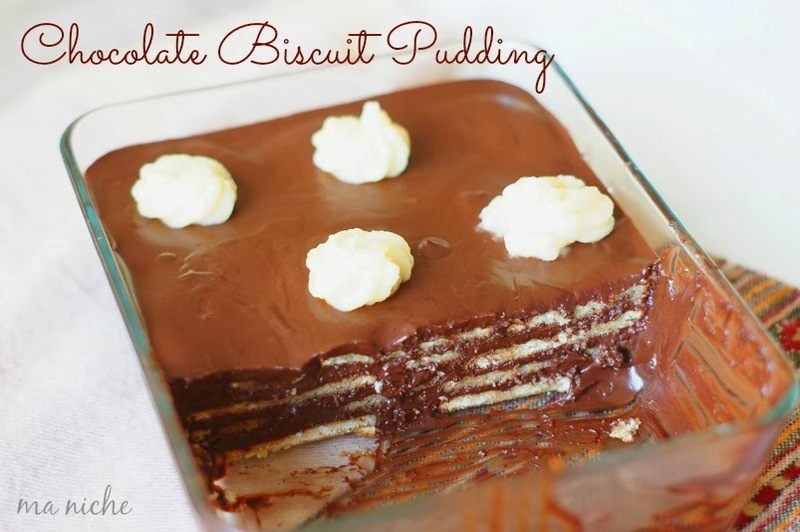 I have never seen a biscuit pudding, but I can't wait o try making this. It looks wonderful and tasty! Stopping by from the Dessert Challenge.